With fascinating details of an imagined future, this apocalyptic novel ties a compelling plot to a no-nonsense narrator. Last Message from Nibiru is an imaginative, cautionary tale about the dangers of excessive corporate power. Debut author Grover Bentley’s story is a creative take on the zombie-apocalypse genre combined with a thought-provoking view of a future world run by powerful corporations. An idealistic protagonist leads the way through a novella filled with death and betrayal. The Mayan prophesies predicting the end of the world have spurred many to imagine a myriad of apocalyptic scenarios. In Last Message from Nibiru, the predicted December 21, 2012 end threatens to come about through the sudden appearance of a small planet that enters the Earth’s orbit. Convinced it is on a devastating trajectory straight toward Earth, people spend the next hundred years preparing for the end of the world. By the time the planet—called Nibiru, or Nemesis—appears to slow down, life on Earth has changed drastically. Major corporations have taken control, replacing whole countries and beginning to explore nearby planets for possible inhabitation. By 2112, when Nibiru has ceased its movement, many people have already abandoned Earth for the relative safety of other worlds. Physicist Jim Calloway is among those sent to the mysterious planet of Nibiru to attempt first contact with the beings suspected of inhabiting it. Excited at the prospect of communicating with an alien race, Jim never anticipates the deadly betrayal that awaits him. The novella follows protagonist and narrator Jim as he discovers the truth about the natives of Nibiru and struggles to survive on the alien planet. Bentley crafts Jim as a fairly remote personality; much of the narration is lacking in emotion, reading like reportage. While some of the distance makes sense in light of the eventual explanation for Jim telling the story, the emotional detachment of the main character often seems strange. Jim merely forges ahead with little sentiment, even when his own survival depends on “putting down” a close friend. A few tears are shed, but his feelings are never fully explored. Supporting characters are equally lacking in depth, and while the short length of the book may be to blame, not much is revealed about any of them. Most problematic, however, is lack of editorial support. Ineffective editing and novice errors prove detrimental to what would otherwise be a satisfactory entry into the science-fiction genre. Simple errors such as the repeated reference to Nibiru as a “rouge planet” and other spelling, textual, and grammatical issues could be avoided with the assistance of an effective editor. Often compelling in spite of remote characters, the novella takes an intriguing view of the ultimate corporate takeover, and it is amusing to learn which corporations end up running the world. Bentley reveals a few interesting aspects of the future he’s envisioned; among the more intriguing ideas are camouflage fatigues that instantly adapt to surroundings for optimal concealment and space suits that can assist the wearer in medical emergencies. 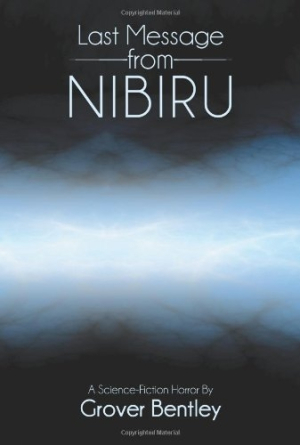 Last Message from Nibiru is an interesting tale. With further attention to proofreading and character development, the novella is sure to appeal to a wide audience.